Few people today realize it, but Ridgefield has been the home of some of the nation’s leaders in producing sacred music in the 19th Century. They ranged from the prolific hymn writer, Fanny Crosby, and the composer Hubert P. Main, who scored many of Fanny’s hymns, to the publishers Lucius Horatio Biglow and Sylvester Main, who printed hundreds of thousands of books of hymns. 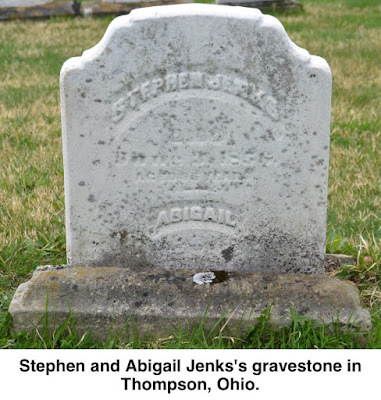 Stephen Jenks was born in 1772 in Glocester, R.I., and grew up in Ellington, a small town in central Connecticut. As a young man, he was stirred by a love of music and began moving from community to community in Connecticut, teaching psalmody — hymn singing — while composing his own music and collecting the music of others he met. By the late 1790s, he was in Ridgefield where he may have taught singing, possibly at one of the three churches in town. 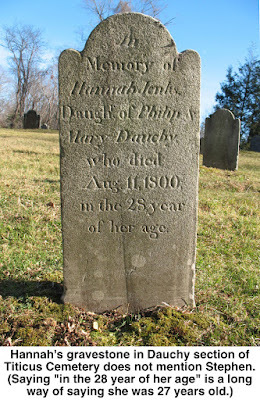 Since he had married Hannah Dauchy, he may have been associated with St. Stephen’s — she was a daughter of Philip and Mary Dauchy and granddaughter of Captain Vivus Dauchy, a French Huguenot who was a pillar of the Episcopal Church here. Ridgefield records indicate Jenks never owned land in town, nor did Hannah. If he were farming, as some histories have suggested, it was probably on the land of his in-laws. 1799, he produced the first of his collections of compositions, “The New-England Harmonist.” It contained “concise and easy rules of music, together with a number of tunes adapted to public worship, most of which were never before published,” according to Jenks himself. Another tune written in Ridgefield and appearing in his “The New-England Harmonist” was composed on the death of George Washington. “Mount Vernon,” which was probably performed in Ridgefield, uses words attributed to Theodore Dwight, journalist brother of Yale president Timothy Dwight. “This tune, with this text, is still sung in the Southern U.S., and now, around the world,” reports Warren Steel, retired professor of music at the University of Mississippi and probably the foremost expert on Jenks and his work. A year after “The New-England Harmonist,” his second collection, “The Musical Harmonist,” offered 35 songs, only 13 of which employed his own music. He went on to publish eight more books of sacred music through 1818. Not all of Jenks’s work was solemn and churchly. In 1806, he published “The Jovial Songster,” which he described as “containing a variety of patriotic and humorous songs.” In it he put many Old World verses to music. There is no record of their having had any surviving children together. 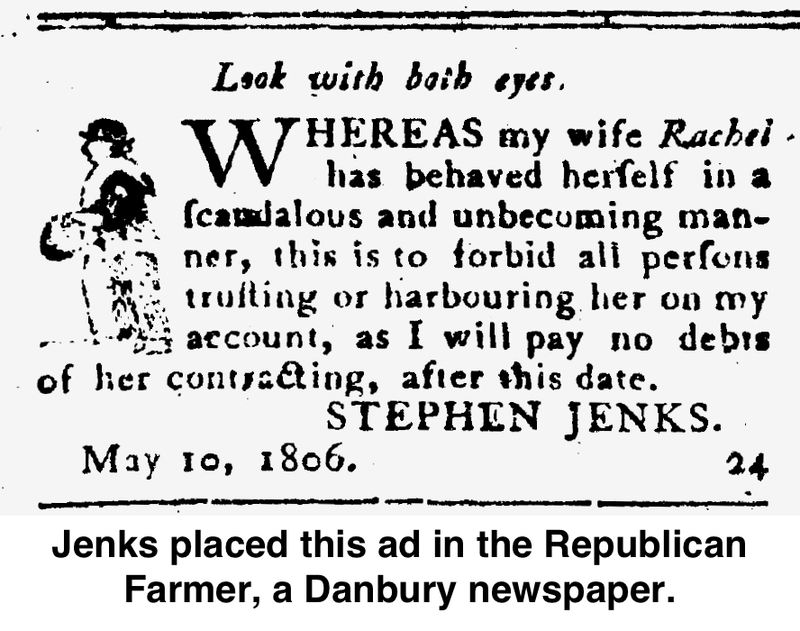 Only eight months later, Jenks married Rachel Travis, a Westchester County woman. Genealogical and local history records identify Rachel as a daughter of Lt. Jacob Travis, a prominent tavern keeper from nearby Pound Ridge, N.Y., who lost his left arm at the Battle of Ridgefield during the Revolution. Jenks in 1801 was hired as the teacher of the new Singing School in the village of South Salem, N.Y., bordering Ridgefield and the place where he and Rachel were married that year. Singing schools were popular in New England and especially in the South in the 18th and early 19th Centuries. They almost solely taught religious music, mostly traditional hymns. South Salem’s was popular enough to last at least 20 more years under other teachers. However, his marriage soon turned sour. 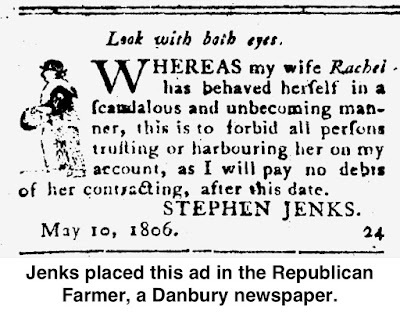 At the top of the front page of the “Republican Farmer,” a Danbury newspaper, on May 21, 1806, appeared an advertisement: “Whereas my wife Rachel has behaved herself in a scandalous and unbecoming manner, this is to forbid all persons trusting or harbouring her on my account, as I will pay no debts of her contracting after this date.” It was signed Stephen Jenks. What happened to Rachel after this is unknown, but presumably, there was a divorce. Professor Steel notes that Jacob Travis’s will, written in 1804 and proved in 1809, mentions his daughter Rachel, “bequeathing to her or to her heirs 75 dollars, perhaps implying that she had children.” Another author has suggested Jenks had two young children by 1805, and another source indicated he “became so impoverished as not to be able to provide for his two sons and that they ‘passed into the custody of friends, and, at manhood, knew not even the whereabouts of their father,’ ” Professor Steel reports. It is also possible the children stayed with their mother, Rachel. From Westchester County, Jenks moved around southeastern New York and Connecticut, spending time in New Canaan, New Haven, Hartford, and in the Hudson Valley and producing more collections of his own and others music. Around 1810 he married his third wife, Abigail Ross, a native of Stafford in northern Connecticut. She was about 22 years old, he 38. Their marriage was more successful than his previous unions, and together they had two sons and four daughters. Jenks periodically fell on hard times. His financial condition had always been tenuous, relying on small-town teaching jobs and the sales of his song books for income. Many of his books involved signing up subscribers who would promise to buy copies. Whitlock announced: “Subscribers for ‘The Delights of Harmony; or, Norfolk Compiler,’ are required to call on Hezekiah Whitlock, or either of the subscribers and received their books. Those who neglect to pay for them by the 1st of June next, may expect cost.” That is, a bill-collector may start dunning them. By 1818, however, creditors were after Jenks and taking serious legal action. At that point he and his young family were living back Glocester, R.I., the place of his birth. 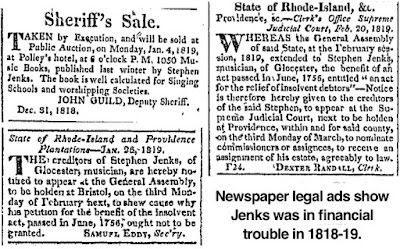 Deputy Sheriff John Guild posted notice in several newspapers that more than 1,000 copies of “music books, published last winter by Stephen Jenks,” had been confiscated and would be sold at public auction Jan. 4, 1819. 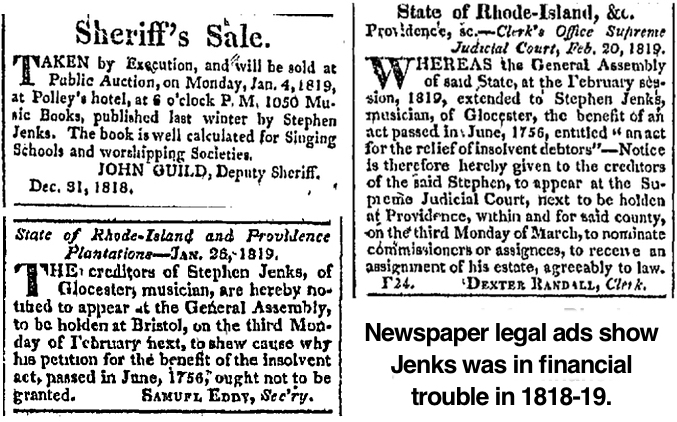 A month later the State of Rhode Island was publishing notices that “Stephen Jenks, musician, of Glocester,” had petitioned to be allowed the benefit of “an act for the relief of insolvent debtors.” In other words, he wanted to declare bankruptcy. One historian says that he “became associated with someone who betrayed his trust and took the proceeds of sale to the extent that Jenks became discouraged, and so abandoned publishing…” Professor Steel suspects Jenks’s printer may have demanded payment for books, money Jenks didn’t have. Glocester was near Providence, and the area had a sizable Jenks clan — including some named Stephen Jenks (also spelled Jencks), one of whom, a blacksmith, was also going bankrupt around then. 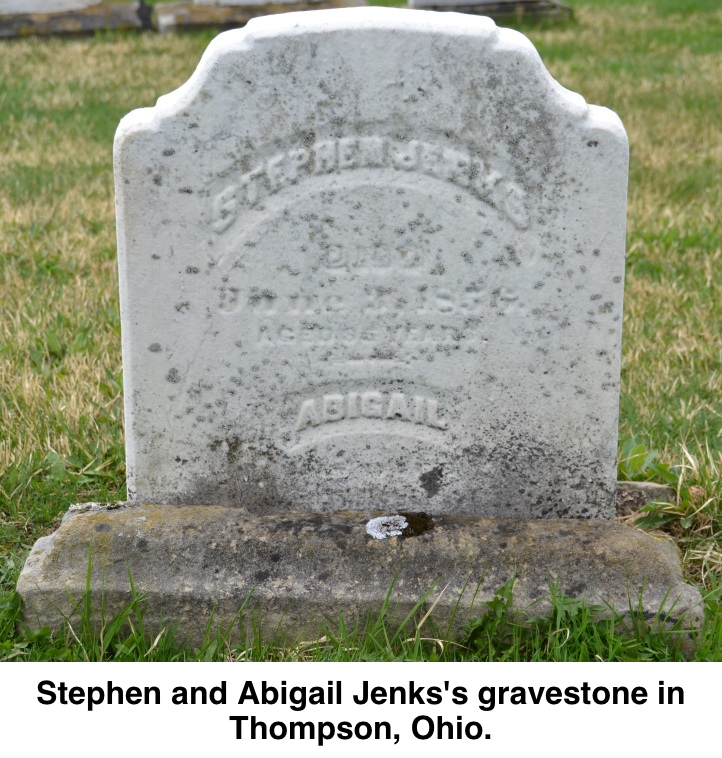 Another Stephen Jenks had operated cotton mills and a munitions factory, and had also run into financial problems. The musician Stephen may have returned there because he was low on money and could find support from family members. By 1829, however, he apparently decided it was time for a major change. He and the family moved to the Western Reserve, a large tract of land given to Connecticut in the 1600s by King Charles II and settled largely by people from the Nutmeg State. It is now northern Ohio. Jenks and his family set up a farm in Thompson, northeast of Cleveland. attention on making drums and tambourines. In the late 1840s he compiled a manuscript of 102 of his compositions — more than 80 of which had been written while living in Thompson. They were never published. In an odd coincidence, this manuscript was acquired after Jenks’s death by Hubert Platt Main, the Ridgefield native and hymn composer of the 19th and early 20th Century, who was also a collector of sacred music. Born in 1839, Main never knew Jenks personally. He eventually gave the manuscript to the Newberry Library in Chicago, which holds it in is vast collection. Jenks died in 1856 at the age of 84. Abigail died six years later.